What does it mean to have Venus in Aries? Does your husband or wife have Venus in Aries? These people have a magnetic personality. Aries, the first sign in the zodiac is bold and fun, and that’s the only way Venus in Aries knows how to love. They are upfront about what they want and aren’t afraid to go after it. They can be egotistical. But, they are also fiercely protective of their loved ones. Planet Venus symbolizes love, relationships, pleasure, and the value we place on objects and leisure. 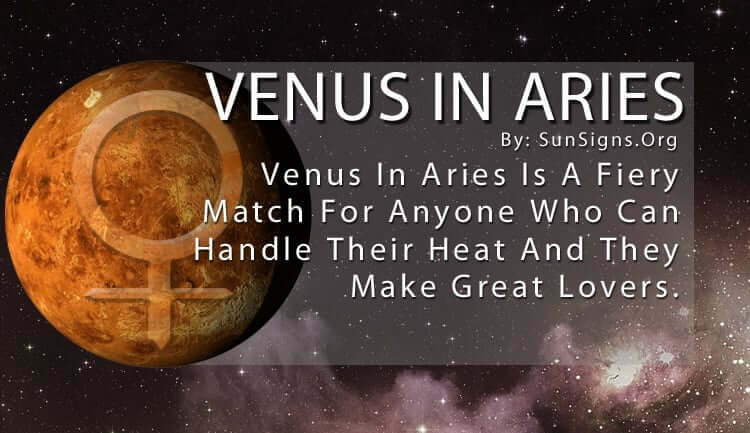 This makes Venus in Aries a fiery match for anyone who can handle their heat. They flirt without boundaries and test the endurance of those they have their eye on. The Venus in Aries zodiac sign people are positively radiant when competing with someone else, even if that someone else is a potential partner. Their fun, flirtatious manner shows off their witty charm and independent nature, often leaving their lover wanting to know more about them. They won’t have to wait long though. Venus in Aries loves to talk about themselves and show off their boundless charisma. Whether it’s a serious long-term commitment they are looking for or just a fling, they will strut their stuff with the same amount of enthusiasm and purpose. They don’t like to play mind games unless they feel that’s the best way to win over the other person. This can be a bit overbearing to some, and a relationship with Venus in Aries is not for the faint of heart. They are active and spontaneous and are always looking for a new adventure with that special someone. They hate slowing down for anything because they are afraid of their life getting too stagnant. The worst thing for Venus in Aries is to get too comfortable or complacent. They need constant excitement and stimulation. Because of this, they expect their partner to entertain them and be up for anything they want to do. It can get exhausting keeping up with them, so they need someone with great stamina and zest for life. Part of that equation includes acting on their many impulses, which takes up the majority of finances for Venus in Aries. They tend to overindulge when it comes to something they want, whether practical or not, for they value pleasure over responsibility. Don’t try to control the spending habits of Venus in Aries because you will lose that argument every time. If it becomes an issue, try to make a competition out of building up a savings account. That’s the only way they would be willing to change how they spend their money. The Venus in Aries people don’t like to get too serious either, so be sure to appeal to their playful side to keep things light and fun. If something happens, that needs their attention they will take care of it. It’s difficult for them to see how their financial habits affect other people, so don’t try to appeal to any logic on that front. But if you make a game out of it, whether they go up against you or themselves, they are more likely to respond the way you want. Venus in Aries is quite set in their ways, so it’s up to others to play within their rules.